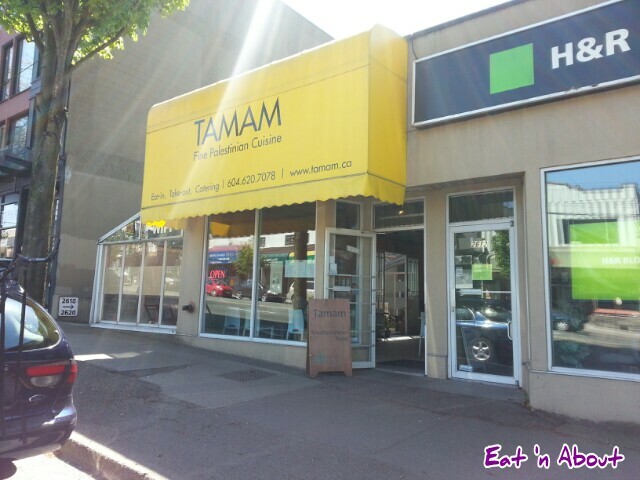 One day on our way to Bo Laksa King’s we drove by the bright yellow awning of Tamam. Hitman caught the text reading “Fine Palestinian Cuisine” and we were instantly intrigued. 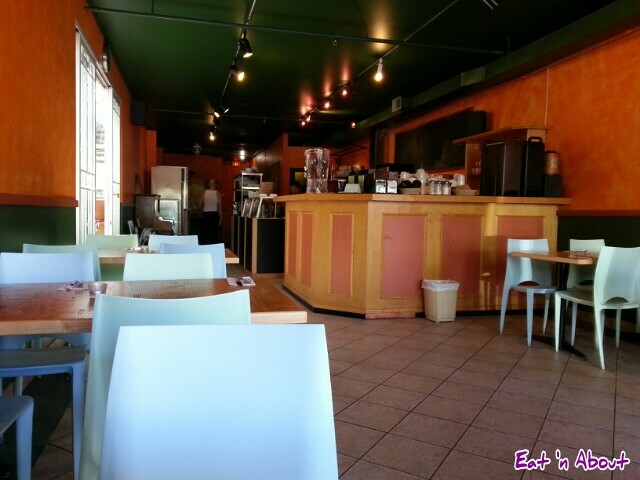 We took a look at their menu online, and found enough items of interest so we made a date to go there for lunch. Prices are very fairly set too. It was very inviting and welcoming. 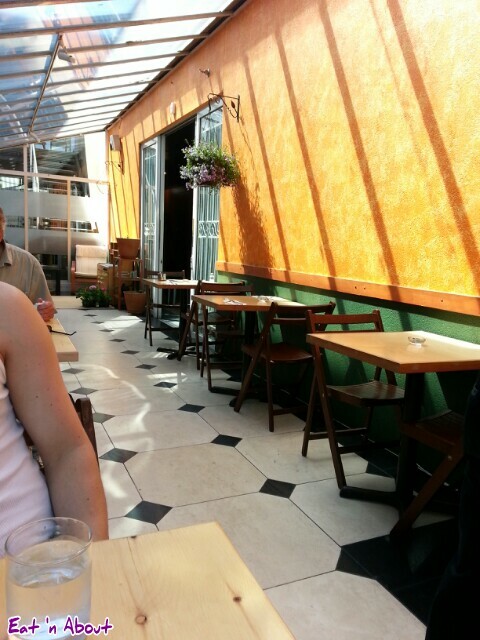 We liked that it was unlike your usual hole-in-the-wall type of shawarma/Afghan/Persian establishments. I know, I’m making assumptions and generalizations, but honestly I don’t know the differences well enough yet to tell Middle Eastern foods apart from one another. But after this feast, I’m very eager to learn more. It was such a nice day the day we went. I tell ya, if you do go on a sunny day, make sure to sit in the sun room. Mind you, it’s just a space between their building and the next, but it’s so clean and bright and cheery and COVERED that you feel like you’re on a patio. 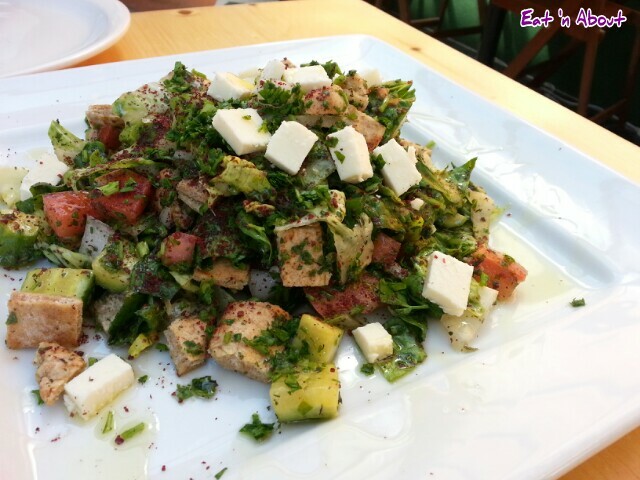 We started by ordering the Fattoush Salad ($6.50). It was a very generous portion consisting of fresh tomatoes, cucumbers, romaine, pita croutons and cubes of cheese (which tasted like feta), all tossed with olive oil and sumac, a common Middle Eastern spice mixture. However, things went a bit awry here as the salad was EXTREMELY salty. So much so that we simply could not eat it. Now we’re pretty certain that a mistake was made in preparing this because we’ve read reviews online and most reviewers were saluting how Tamam was probably the least salt-philic Middle Eastern establishments there is. We figured they might have forgotten that they’d already salted this, and double-did it. Unfortunately we had to send this back. In its place we ordered the Mutabal. 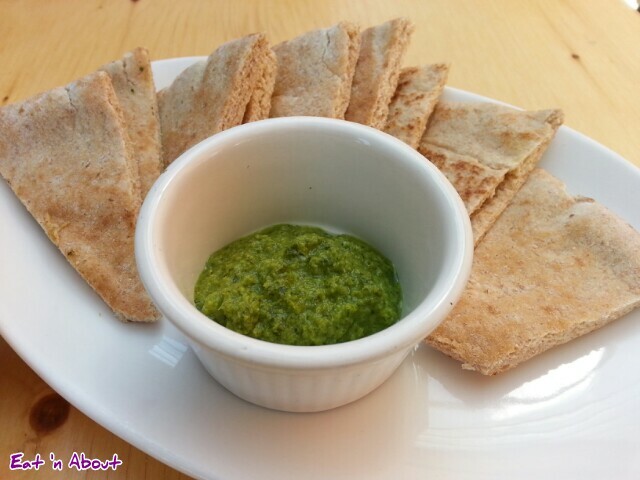 Mutabal ($6.00) is very similar (if not exactly the same) as a baba ghanoush. And I am a fan of both. This was served with pita bread and a hot sauce made from jalapenos. The mutabal was very creamy and smoky. There were bits of unmashed eggplant along with the skin which I appreciated. I like my dips such as these a bit chunky sometimes. I believe there’s also a sprinkle of smoked paprika and chopped fresh parsley. I only wished they had provided more pita bread. Hitman decided on the Mujadarah with Baked Chicken ($9.50). Now Mujadarah is what we would’ve called the side dish as it’s the grain portion. But I think in Palestinian cuisine, or at least here at Tamam, it’s the star of the show as it’s Mujadarah with Baked Chicken and not the other way around. So then what is it? It is a grain dish made of rice, lentils and roasted onions and it was very delicious as the grains and soft lentils absorbed whatever liquid it was cooked in. Hitman says it reminds him of comfort food his Mom used to make. This was served with another side of pickled red cabbage. The chicken portion might’ve been a bit small for Hitman though, him being a guy and all. For me though this would’ve been the perfect portion. It was juicy and moist, perfectly seasoned and cooked. 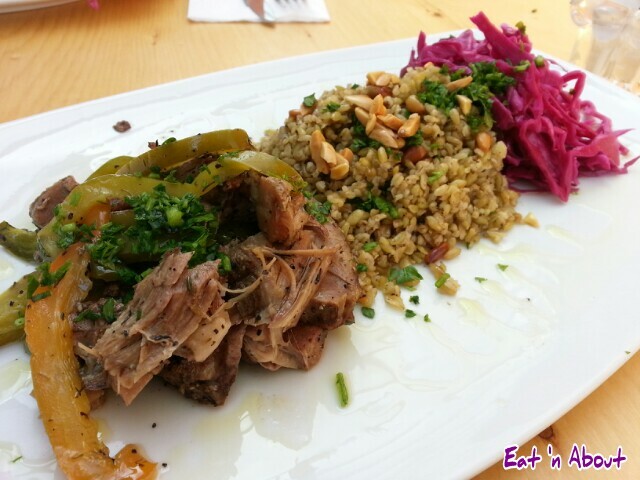 I, being a huge lover of lamb, went for the Freekeh with Roasted Lamb ($10.50). 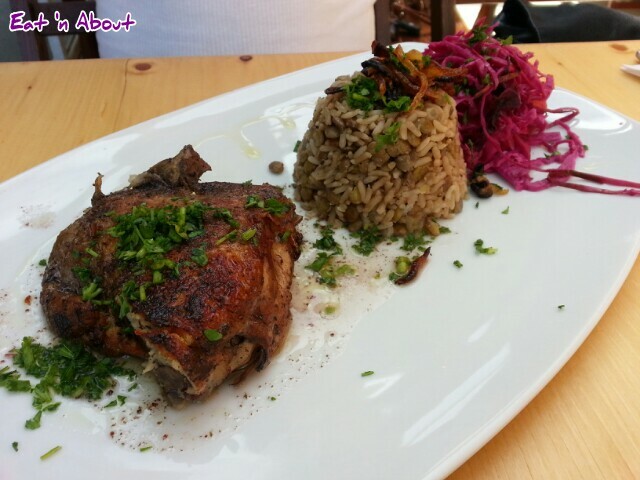 Again, the Freekeh (heehee) seems to be the main event. It’s simply described as “toasted green wheat”. It was soft and chewy much like barley. The toasted almonds and fresh parsley were a nice touch and again the freekeh just absorbed the flavors of whatever broth it was cooked in. The lamb was tender and also perfectly seasoned. Another thing I noticed was that the food came out piping hot. I mean I actually saw steam coming off of both our dishes and I commented to Hitman how that’s actually a very rare sight, and I don’t remember the last time I saw it aside from a Chinese restaurant. Needless to say I was extremely impressed with Tamam and I can’t wait to go back. In fact, I’ve already made a date with Fannypack!